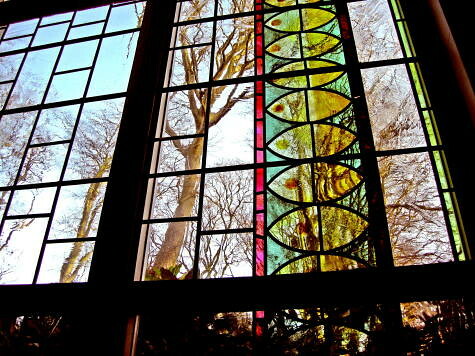 Yes, certainly – we can design and make an abstract stained glass window. It is always a question of what you judge is right for the room and building in question. Good modern windows can work well in new buildings, or old. But the point is, they must be well-designed. The reason I say this is because abstract art sometimes reflects an inability to design or draw in a non-abstract style. And in cases like these, abstract art is often bad art because the underlying capacity for draughtsmanship is missing in some measure. Think about it: if someone cannot draw a literal apple – convincingly, and “as it is” – it is impossible they can abstract from it and re-draw it in a modern idiom (“an apple for our times” if you wish). Yes, we can certainly “do” abstract. And this is because we can also do figurative design. Agreed, crematoria are (in some sense) unfortunate buildings because (unlike churches) their celebrations and rituals are only concerned with death. My point is, you don’t need a designer-maker who does abstract art because he cannot draw. Rather, you need a designer-maker who can design-make whatever-it-is that works best. My final example: a 19th century rectory, recently restored and modernized, whose owners wanted stained glass for their new front door. Their chosen themes included the surrounding countryside (the Malvern hills) and also the Fibonacci sequence (Fn = F n-1 + Fn-2). They also liked Piet Mondrian’s work. See here for the full abstract stained glass window which shimmers and glows at the end of the long, dark hallway. In short, abstract or traditional: whatever works, provided that it’s well-designed and properly made. 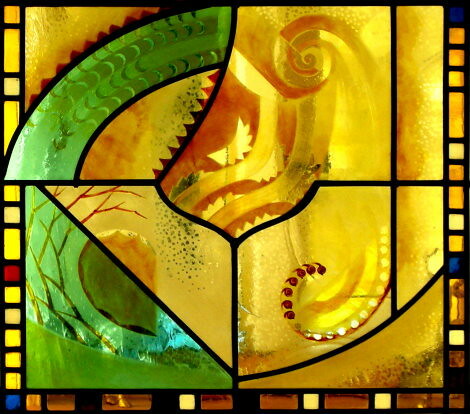 If you are a glass painter and you want to learn more about kiln-fired stained glass painting, see here.